You can't just eat one of these. Or just two. 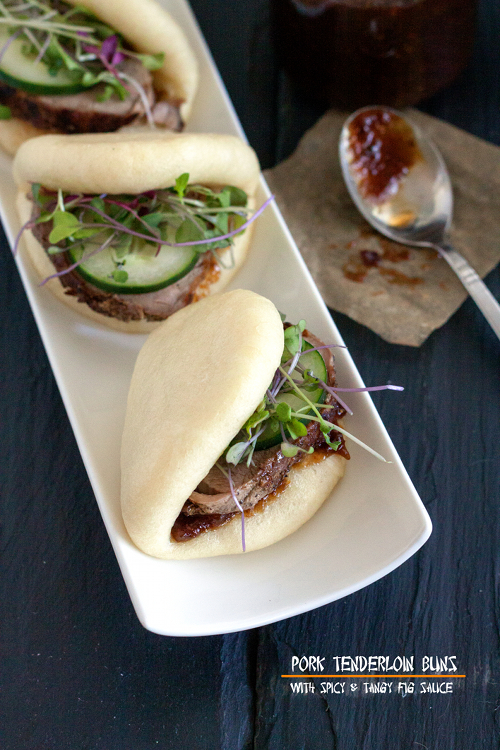 Because face it; slices of roasted pork tenderloin tucked in soft pillowy buns, smothered with spicy, sweet and tangy fig sauce, adorned with crispy vegetables, it's just as addictive as crack. One of many reasons why I can't be a vegetarian. Place milk, yeast and sugar in a large mixing bowl, stir together to combine and let stand for 5 to 10 minutes until foamy. Add flour, baking powder, salt, and 1/4 cup of oil into the bowl. Using your hands, knead the dough until all of the ingredients are well incorporated. Continue kneading until the dough is smooth and elastic. Form the dough into a ball, transfer to an oiled bowl, turn to coat. Cover the bowl with plastic wrap and let rise in a warm place until doubled, about 1-2 hours. Punched down the dough, transfer to a lightly floured surface. Roll the dough into a long log, then cut into 30 equal sections, roll each of them into a ball and place them on a baking sheet lined with parchment paper. Cover the baking sheet with plastic and let rise for another 20 minutes. Cut 30 4-inch parchment squares. Take one ball and place it on a floured surface. Take a rolling pin and roll the ball into a long oval. Brush the surface with oil and fold the oval in half. Place it on a parchment square. Repeat the process with the remaining dough. Cover with plastic wrap and let rise for about 30 minutes. Working in batches, place buns in the steamer (still with parchment squares on), be careful not to overcrowd. Steam the buns for about 5-7 minutes, until the buns are well cooked. Cool down a little bit before filling and serving. Or, if you're not planing to use them immediately, store in a large plastic bag and keep in freezer, re-steam them before using. Combine all of the ingredients in a medium saucepan. Cook over medium heat and bring to soft boil. Reduce the heat and simmer for about 5 more minutes. Remove saucepan from the heat and cool down completely. Pre-heat the oven to 350 F. Rinse the pork and pat dry. Mix brown sugar, chile powder, salt and pepper, and rub the pork tenderloin with the spice mixture. Heat the oil in a oven safe skillet ever medium-high heat. Sear the pork until golden brown on all sides. Transfer the skillet to the oven and roast until the pork is done (6 to 8 minutes for each inch of thickness). Take the pork out of the oven and let rest of 15 minutes before slicing. 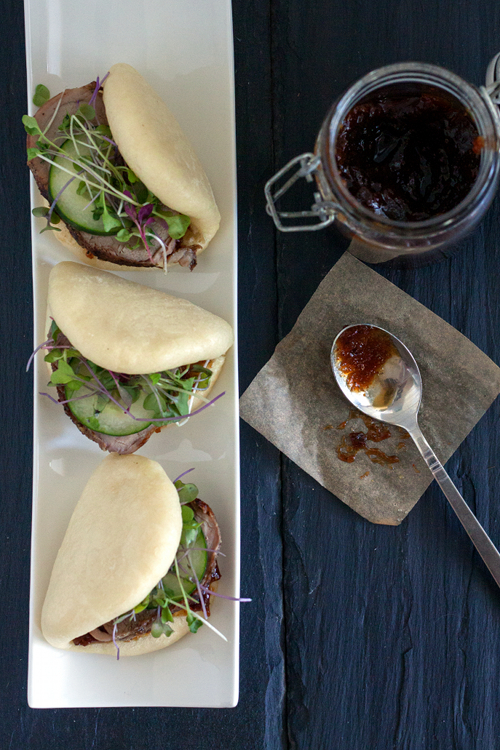 Spread about 1 teaspoon of fig sauce in the center of the bun, place a slice of pork and a slice of cucumber. Add some micro greens and serve. I remember had something similar, but with stewed pork belly. These must have tasted HEAVENLY with tenderloin! I want to make these buns so bad, but . . . can you tell me what a steamer is? I have never heard of this. If I do not have one, how else could I bake these lovely buns? These look wonderful! 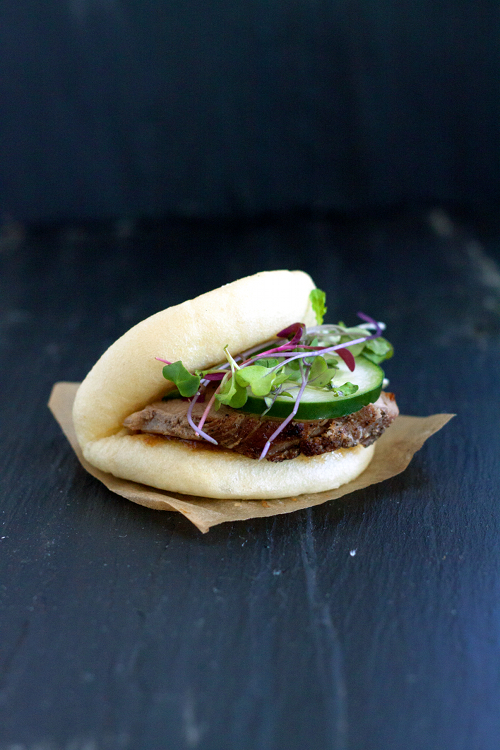 I've been wanting to make the Momofuku version with pork belly, but I've never cooked pork belly before and the buns call for powdered milk and other ingredients I don't have. I think it's a great idea to use pork tenderloin, and the regular milk in the buns sounds like I might be able to do this. I'm going to try these, can't wait to taste them! Hope they come out as mouth-wateringly delicious as yours look. Beautiful photos, by the way!